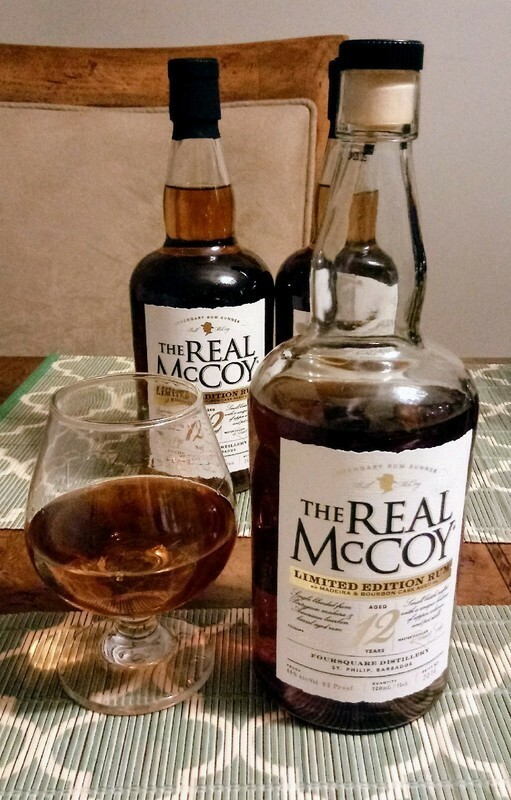 Have you found an online vendor selling The Real McCoy Limited Edition12-Year? Další parádní kouzlo v podání osvědčeného rumového mága R. Seala, u kterého nemusíte šetřit superlativy. Papírově to sice vypadá, že vychází z předlohy dvanáctiletého Doorly´s, ten však v přímém porovnání vychází výrazně ovocněji. Nasládlá vůně s oříškovou stopou také lehce odkazuje na Zinfandel cask verzi, ale i přes 46% alkoholu zůstává ve své intenzitě o stupínek níže. Za to pravděpodobně vděčíme finálnímu madeirovému zjemnění, které do chutí přináší onu notnou dávku svěžesti a lehkosti. Myslím, že svým profilem mnohem více zapadá mezi trojici Port-Zinfandel-Doorly´s 12, než ke svému zemitě-tabákovému provedení v základní verzi (s černou etiketou), která si kráčí po vlastní odlišné cestě. K finální devítce přidávám plusy za design láhve a obvyklý nulový cukr. The color is dark, probably imparted by the Madeira casks. The nose hits you with coconut, plums, brown sugar, subtle overly ripe bananas, sweet tobacco and leather. Given a little time, it's extremely inviting. Apart from the Madeira ageing, this is also a slightly beefed up version of the original 12 year, weighing in at 46% vol. The taste is very full and devolps quickly with dark notes of leather, tobacco, roasted coconut, and slightly spicy pepper. There's an underlying and rounded sweetness underpinning the power perfectly. This is bloody good and pure old barbadian rum. Love it. Bottled at 46% aged in madeira & bourbon casks. Unadultraded rum from what I am quickly realizing as the vanguard rum distillery Four Square form Barbados. If you see it get it without hesitation. Fantastic limited barrel aged rum. An absolute no brainer buy. The bump in proof really makes this shine. The sweetness (created without additives, just impressive use of barrels) is absolutely perfect. My favorite style of rum, if you can call it that, are these wine finished spirits that impart sweetness while not being sweet. Masterfully done. In der Nase sind die Holznoten sehr gewichtig, werden aber sehr elegant von Karamell und kandierten tropischen Früchten getragen. Im Gaumen weich und angenehm warm, frisch gebranntes Karamell, frisch getoastetes Holz, frisch geschälte Früchte, frisch gemahlene Gewürze, um nur Einige zu nennen. Im Abgang wunderbar lang, nach Holz und Karamell. In the nose the wood notes are very weighty, but are carried very elegantly by caramel and candied tropical fruits. On the palate soft and pleasantly warm, freshly burnt caramel, freshly toasted wood, freshly peeled fruits, freshly ground spices, to name but a few. In the finish wonderfully long, after wood and caramel. Dette var den tredje rom vi smagte. En rom der for mig giver noter af karamel - kokos - ristede nødder. I had a very good rum tasting session with my buddy at one of the best rum bars in Chicago where I tasted the white label Real McCoy for the very first and absolutely the last time, and the white label Real McCoy 12 year old easily took the last spot on this tasting, and after well over 600 aged rums tasted during the past 15 years, is easily on my least favorite 10 rum list. This is very close to my all time lowest rum Barbancourt 8 and 15 year old rums. Awful vile liquid, stay away from this one. I had this side by side with the Real McCoy 12-Year and I think they're both very similar and very close. I slightly prefer the regular Real McCoy 12-Year. I find that stronger rums are better if they're very highly rated to me, and this one is right on the borderline where the regular version is still just barely better to me. Smells and tastes of oak, bourbon, caramel, and spice. Smooth for 46%abv. Almost a tie with regular 12-Year, though again I slightly prefer that one. The color is lighter brown hue, the label claims no "artificial colors or additives", so if something "natural" like tannin infusion was used, I cannot say. I would not mind, since color adjustments is defacto standard practice of the industry, bar some independent bottlers. The nose is intense and pleasant, especially after adding a splash of water (recommended, since it's a 46 ABV rum), harmonious notes of gingerbread, apricots, dried apples. The palate is on the sweet side, more apricots, brown cake, brown sugar, some vanilla, with pronounced Madeira cask influence, tempered by tannin astringency from the oak, medium-bodied with lingering, pleasant, warm finish. The main selling point is the perfect harmony of this rum, both on the nose and on the palate. Currently my favorite rum. A little more oak, with complex fruitiness from the madeira casks. A good amount of pot-still influence. Overall, a very nice rum, not sweet at all. This rum is produced in Barbados by Richard Seale, Foursquare Distillery. The space is the warehouse for a minimum of twelve years. God rom med en kompleks smag. Synes duften mangler lidt, og smagen også lige det sidste. The addition of madeira cask-aged rum adds a little extra interest to the already exquisite RM12. A little more oak, with complex fruitiness from the madeira casks. A good amount of pot-still influence. At times I detect a bit of a cough-syrup flavor, but it's subtle enough to not interfere with the pleasure of sipping, which I will be doing on a regular basis. very light and pleasant aroma, light citrus and slight fruit. warm in the mouth, softer when a little water is added. Overall, a very nice rum, not sweet at all. A nice change from the majority of sweet rums available now. Nose: water and alcohol. The madeira is very forward in this rum. The wood lingers in the finish.